I’m interrupting my Polish stories to take you briefly to Northumberland. 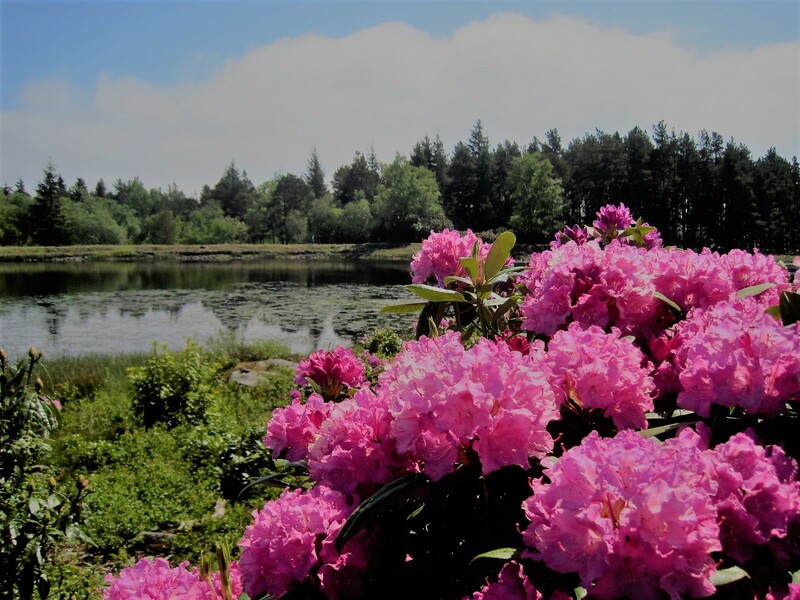 The reason being that it is rhododendron time of year at Cragside, and if we don’t go soon you’ll have missed them. I managed to capture them in the last week of May, when they were looking truly fabulous. Cragside is rightly famous for being the first home in the world to be lit by hydroelectricity, and makes a fascinating tour. My interest, however, lies in the acres of woodland walks and the formal gardens which surround the house. Former owner, Lord Armstrong, is described as a landscape genius, and I saw nothing to make me dispute that claim. To get the lie of the land you can take the 6 mile circular carriage drive around the estate. On a sparkling blue sky day it is a sight to behold. Within that there are a selection of waymarked trails and over 40 miles of signposted footpaths. Enough, even for me? As always I am magnetised by the water and my first stop is Nelly’s Moss, where there are two lakes to walk around. Craggy boulders split the woods and some of the trail is made up of solid stone slabs. No-one to disturb, but a curious duck or two. 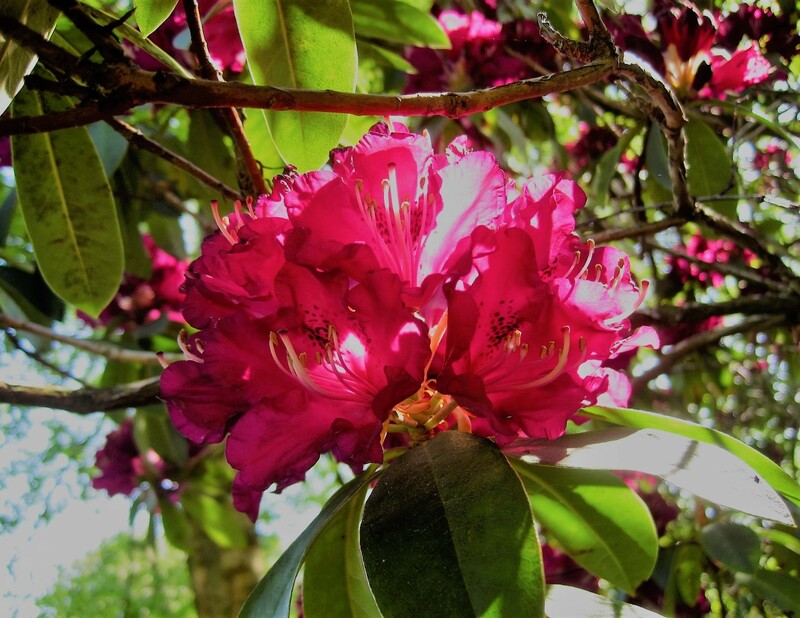 No doubt you can tell I’m besotted by the rhododendrons, but the pleasures don’t end there. In fact, they’re just beginning. There’s even a Trim Trail, should you wish to test your fitness levels. Perhaps I shouldn’t define that as a pleasure. I’m content to drive back to the Visitor Centre, fronted by lovely Tumbleton Lake. Parking and restaurant are close by, or you can simply picnic beside the lake. Some folk like to travel in style. The Armstrong Trail follows Debdon Burn, past the Archimedes Screw and the Pump House, through woodland leading to the Iron Bridge. From here you can climb through the sea of azaleas and rhododendrons up to the house, or you can take a detour to the formal gardens. I don’t remember these from my long ago visit, but the setting is superb. On a truly radiant day, with the valley below rolling down to Rothbury in the distance, you just want to sit on a bench and breath deeply. No such luxury for the gardening team, but they seem happy in their work, rooting out disobedient weeds. I linger over tubs of tulips, beside a bedraggled rose and among the cool greys of the fernery. Irridescent colours gleam at me, and it doesn’t really matter that many of the flowers are past their peak. I can still luxuriate in their finery. I hope you enjoyed sharing Cragside with me. Full details are to be found on the website. Meanwhile I’d like to share another great selection of walks. It’s been a busy but wonderful couple of weeks and I won’t be posting a walk next week. Instead I’ll be taking life a little more easily in the Algarve. Among other things I have a wine tasting session that I need to attend. Time to put the kettle on now, and settle in for a good read. Let’s accompany Janet to the mall next, for some high end? This post from Denzil gives you a choice of 4 walks and a lovely castle. Not bad, hey? As always, thanks to you all for walking with me and for sharing such wonderful companionship. I need a little time out but I’ll be back as soon as I can. Take good care till then. Oh bugger. That is not going to work. She is heading to the UK in Autumn. Oh well, next trip. Lovely post and walk, Jo! I really enjoyed this. And have a great time in the Algarve. Hope you have many sunny days there. Jo, these photos are magnificent. I especially love the large fluffy puffy ones!! Some of them remind me of the skirt of a flamenco dancer. Just gorgeous photos. Thanks for the floral treat! You NEED to attend the wine tasting 🙂 🙂 🙂 you go girl. Cragside looks , peaceful too, did you have the place to yourselves? That is the perfect setting for rhododendrons. Where they can spread their wings and the strong colours are in proportion to the landscape. In a small space, not so much. Maybe I inherited rather too many of them and they overwhelm. 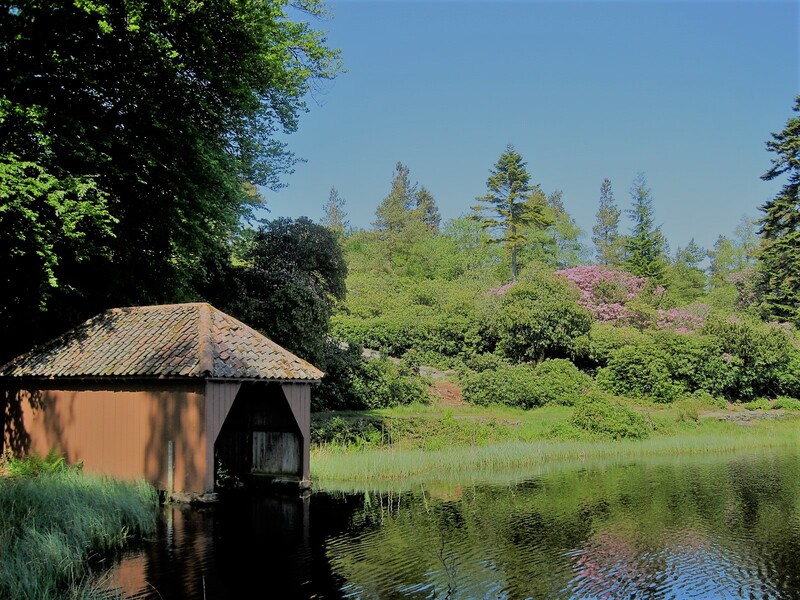 Cragside is a place I’ve had on my radar for a while, it looks a great place to visit. Thank you for sharing all that gorgeousness Jo! We had gigantic hedges of bright pink and orange azaleas in some of our plantation bungalows. Have never seen the variegated ones though. Great pictures Jo, lovely colours. I think we will give Cragside a miss this year, there is too much competition for our NT membership! A few days now, getting ready for the North of England! I love the flamboyance of rhododendrons and their colours are wonderful. I boast of a lovely red one in a pot but when I see a garden full of them I realize how puny it is. Down South here, we have Exbury Gardens which is where I go to see these gorgeous blooms but I didn’t manage it this year. Many people open their gardens at this time of year for the National Gardens event, so most Sundays sees me heading off to admire someone’s blooms, sometimes returning with a cutting or a plant I’ve bought from them. You probably have the same scheme in your area, all the money goes to charity, and the coffee and cakes are usually top class. How beautiful…it must be very enjoyable to take the circular carriage drive around the lovely gardens.